Excel shortcuts are a fundamental component of efficient financial modeling. Quite simply, it's well worth the time to learn them. Here, Wall Street Prep has compiled the most important time-saving shortcuts for Excel 2016 for both Windows and Mac. If there are shortcuts you use all the time that you don't see here, let us know using the comment form below and we'll add them. 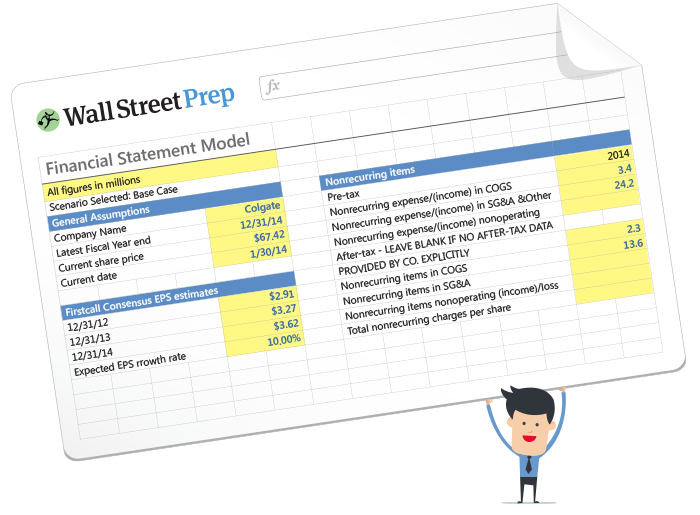 Turbo-charge your time in Excel Used at top investment banks, Wall Street Prep's Excel Crash Course will turn you into an advanced Power User and set you apart from your peers. Number format ctrl+shift +! ctrl+shift +! I am thinking of purchasing the Premium Package, but the demo videos are shown in Windows. I have a MacBook — will all features also work in Excel for Mac, or is Windows is a necessity? Although the instructor in our lesson videos is on a Windows version of Excel, you can absolutely go through our courses on a Mac. You may find a shortcut here and there that Excel for Mac doesn't have, but our lessons will always show you the native/non-shortcut way of doing things as well, so you'll be all set! By default, Mac function keys control system settings and Mission Control. To use function keys for shortcuts, you'll need to hold down the "fn" key before you press F2, F3, etc. You can change this in System Preferences > Keyboard by checking "Use all F1, F2, etc. keys as standard function keys." You can now use the function keys without pressing "fn." I don't think there is a shortcut for that unless you build it in VBA - thanks! You can add ALT+F1, quikly create a chart based on the table or range that is where the cursors is. Also, CTRL+T seems like an obvious one, to create a table! For some reason, the font increase/decrease does not work on my Mac. If you are referring to the ribbon command to increase or decrease font size, then yes, you cannot use the ribbon command of Alt H F C to access the command. With Mac, you will have to use the mouse to access the ribbon. Thanks! Unfortunately not - the program itself controls the shortcuts. You need to work on a Windows version of Excel to utilize those shortcuts. Do you have all these shortcuts for German Keyboard? I apologize - we only publish our shortcuts in English. Take care! Is there a shortcut that allows us to reverse the sign of the value in a cell? If you have the Boost add-in tool, you can press Ctrl Alt Shift \ to reverse the sign of a number. Hope this helps! on a PC, when hitting alt it shows all the shortcuts to navigate through the different tabs. What would be the equivalent of that on a MAC? I have excel 2011 for Mac. Is this outdated? Not necessarily - Excel 2011 should be fine - thanks!